A huge 'moon' on the roof of the Stopera ?! Stichting Barstow painted a balloon of six meters wide with glow-in-the-dark paint. This fake moon looks almost bigger than the real one (which has a diameter of 3475 kilometres). This moon represents the craziness of the city, the lights and the crowds. That’s why the title of the work is ‘Moonburn’; like the sun, the moon also affects humans. Glow-in-the-dark paint turned out to be the solution. Now it’s able to reflect the lights of the city. At night it charges using the energy of the city. 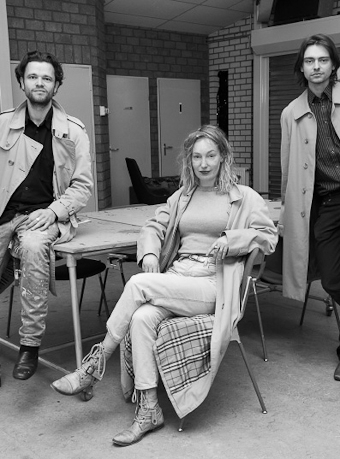 Stichting Barsow (NL) is an artist collective founded by Steven Bos, Susan Lanting and theatre maker Gover Meit. They graduated from the Gerrit Rietveld Academy in 2009, after which Bos en Lanting continued their studies at the Sandberg Institute.